I’m taking liberties with the title of this recipe. Although there are many variations, I believe that a true Roman carbonara is made with eggs, pancetta, and grated Pecorino Romano cheese; in addition to the lemon, this one uses heavy cream (a common yet inauthentic ‘addition’ in many restaurant carbonara sauces), and leaves out the crispy pancetta. But I saw this recipe back in springtime, when lemons were in season, in a La Cucina Italiana magazine. We made it once and it was delicious; I unfortunately sent the magazine home, but today fiddled with the recipe and this tasty version came out. While you wait for the water to boil for the spaghetti, beat together in a bowl all the ingredients except the fresh herbs (parsley, thyme, marjoram), which will be used as a garnish. When the water is boiling, add 2 tsp of sea salt, and then the spaghetti. When the spaghetti is al dente (or however you like it), turn off the heat, drain all but a little bit of the hot water; the bottom of the pot should be just slightly wet. If you are dumping the spaghetti into a colander, be sure NOT to “wash” it with cold water; you want to keep it hot and starchy. Put the spaghetti in the colander back into the pot with the remaining hot water. Dump the sauce mixture into the spaghetti pot, and mix for a few minutes with a fork. Like a regular carbonara sauce, the heat from the spaghetti will cook the raw egg without having to re-light the stove. Serve hot, with the chopped herbs as garnish. 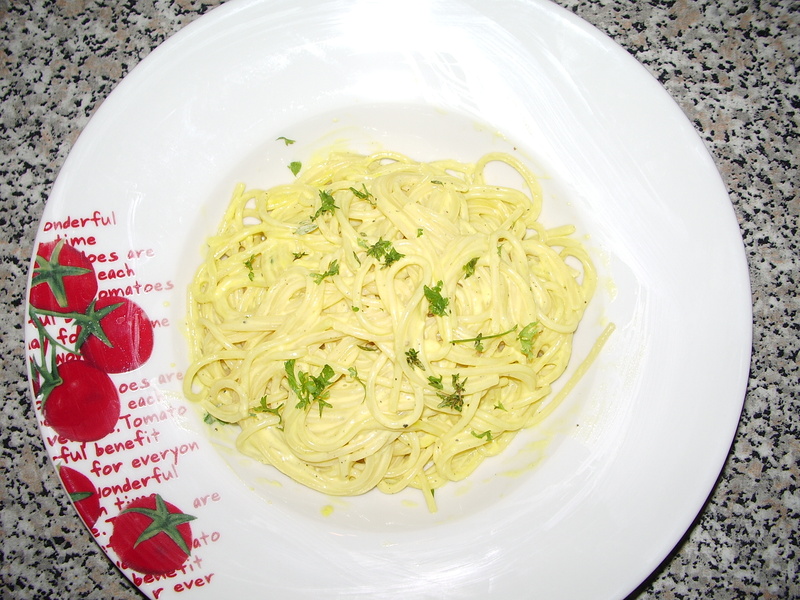 This entry was posted in food, recipe and tagged carbonara, La Cucina Italiana, pasta, recipe, spaghetti. Bookmark the permalink. Looks delish! I told Adam I would make him a yummy meal this upcoming weekend so I’ll try out this dish. I’ll let you know how it turns out! Oh, good–hope you like it! made the spaghetti! it was delish!